How do I clean and protect aggressive non-skid decks? Hi, I have a question regarding the cleaning and protecting of my non-skid surfaces. As I’m sure you are aware, all non-skid surfaces are not the same so my question pertains to cleaning and protecting the type on MY boat. Mine has somewhat of a prism pattern that has proven to be difficult to clean with basically scrubbing from all angles. If you are familiar with Formula boats of the mid 90’s you’ll know exactly what I’m talking about. Can you give me your recommendations for this type of surface? Check out the right side of the pic for an example. The Sure Step system works on all types of non-skid as well as smooth surfaces. The aggressive prism type used by some Formula boats is also used by Tiara and others. 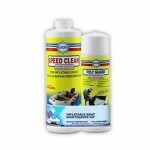 You need to deep clean the deck first with Boat Clean Plus and Boat Scrub and then protect the decks with Sure Step. Here is a link to our Video that will show you how to: Sure Step, you will find them much easier to maintain, typically washing with a mop or soft wash brush. No more scrubbing. Also, Boat Scrub will do an excellent job of cleaning and polishing your Stainless Steel sink and other stainless on your boat.